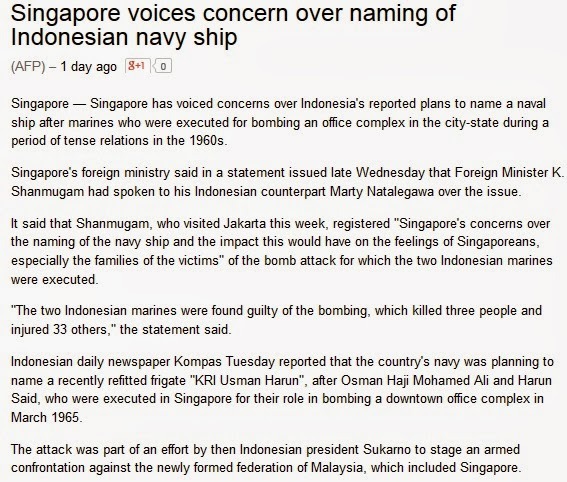 A few days back, Indonesian authorities made the decision to name a naval ship after marines Osman Haji Mohamed Ali and Harun Said who were executed for bombing MacDonald House in Singapore during a period of tense relations in the 1960s. As expected, Singapore registered her protest at the decision only to be flatly shot down by the Indonesian authorities. When viewed in the broader context of the upcoming Indonesian General Elections, it could explain Indonesia's move as a means of rousing nationalism and mobilizing the electorate. After all it is not the first and last time that Singapore is being made the bogeyman. "There should be no intervention from any other country," said Agus Barnas, spokesman for the ministry for political, legal and security affairs. Djoko Suyanto, the minister responsible for coordinating the three portfolios, said "Indonesia had the authority to set its own criteria for naming heroes and to name warships after them." If you wish to gain a better appreciation of this part of Singapore's history, you may check out this documentary titled "Diary of A Nation" which depicts the key moments during KONFRONTASI. Hopefully it will help our readers better understand Singapore's history and vulnerabilities.